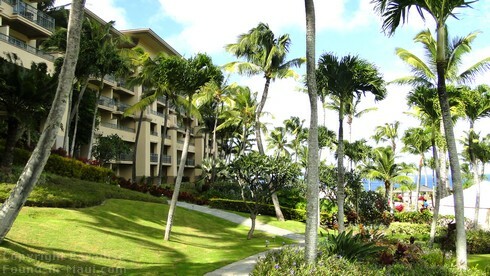 Class and sophistication are synonymous with the 5-star Ritz Carlton in Kapalua, Maui! This luxurious Kapalua Resort property is incredible: it's surrounded by two championship golf courses, has direct access to one of Maui's premier beaches (D.T. Fleming Beach Park), has top notch amenities and services, and is located in the midst of a resort that even has a pineapple plantation! Luxury is their specialty: the richly appointed guest rooms with their large lanais (balconies) and dark wood flooring is sure to impress. Heading outdoors, you'll see their beautiful 20000 square foot sundeck with its tri-level swimming pool, plus luxury cabanas like no other I've ever heard of on the island. No high-class Maui resort would be complete without access to one of Maui's world-class beaches. The Ritz is no exception and guests have direct access to D. T. Fleming Beach. Speaking of luxury cabanas, I just have to tell you, these aren't your typical run-of-the-mill cabanas. They've got personal cabana attendants, a flat-screen TV's, iPod docking stations, cell-phone outlets, a refrigerator, plus a ceiling fan with lights! Not only that, but they welcome you with a tropical fruit platter, offer beverage service for four, your choice of magazines and local newspapers, and the list goes on... and on! Pretty darned awesome! 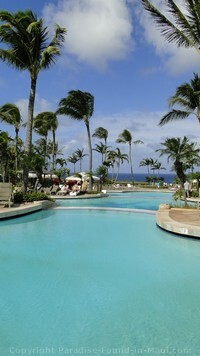 If you want even more pampering, check out the Ritz Carlton Kapalua Maui's 17000-plus square foot spa. They offer treatments inspired by the Hawaiians themselves with private outdoor shower gardens, couples cabanas, volcanic stone inspired grottos with whirlpools, steam rooms, saunas and more. 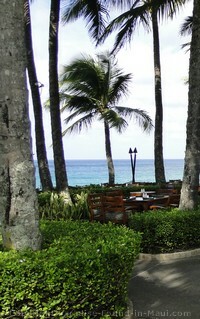 Hungry guests have plenty of options for dining at the Ritz Carlton in Kapalua, Maui. You can begin your day at this Kapalua resort with breakfast at the well-rated plantation-style Terrace Restaurant. For lunch, you can dine on the sundeck via the Pool Bar and Cafe, or for something a bit less casual, you can get dressed and head over to the Alaloa Lounge in the lobby or maybe The Beach House Bar and Grill where you'll dine under a canopy of over 40 mature coconut palms fronting the beach! For dinner, you can head on over to The Banyan Tree restaurant and enjoy the breathtaking ocean views with their eclectic Pacific cuisine. There's also the highly rated Kai Sushi, or a light dinner on the sundeck at The Pool Bar and Cafe. In the evenings, the Alaloa Lounge is a nice spot to relax with live entertainment five nights a week! This Kapalua resort property is easy to find since their address is actually on a street of the same name: 1 Ritz Carlton Drive. To get here from West Maui locales such as Lahaina, Kaanapali or the Kapalua Airport, just follow the Honoapiilani Highway north until you get to Office Road. Make a left turn here and follow the road until you get to Ritz Carlton Drive. You won't be able to miss the enormous Ritz Carlton once you get there! One of my favourite ways to search for the very best rates is by using Booking.com (see search box to your left.) They search rates from all of the major sites at once so you don't have to. The results are then displayed on one easy screen, and when you see a rate and site that you like, just click the link to book from them directly. It's easy as can be! Kapalua Maui: Fun Things to Do, Places to Stay, Dining and More!